The Roger Black, auto incline, easy folding treadmill has an innovative folding mechanism so you can fold it completely flat with the console and handles sitting in line with the running deck. 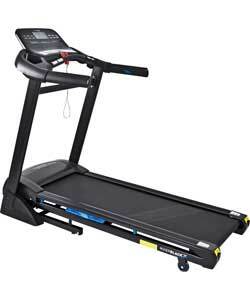 The treadmill is 100 per cent built, meaning it is ready to go when you are. 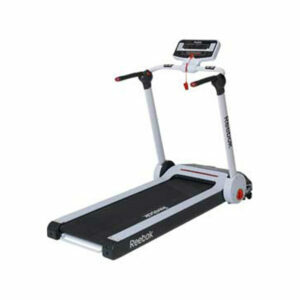 From beginners to ambitious runners, this Roger Black treadmill gives you indoor running at its best. With a variety of programmes including body fat analysis, this treadmill will help to improve your cardiovascular fitness. Make working out a breeze and burn more calories as you do it. Exercise your legs and improve your cardio as you do it. Intensify your workouts with up to 15 degree incline training. Incline training recruits more muscles throughout the lower body from the calves to the glutes. Console feedback including: time/speed/ distance/calorie/pulse/program. Running surface size L121, W41cm. Programmes include: 1 manual, 10 pre-set, 3 user settings, pulse control and body fat analysis. Size folded H25.5, W71.5, D162.5cm.